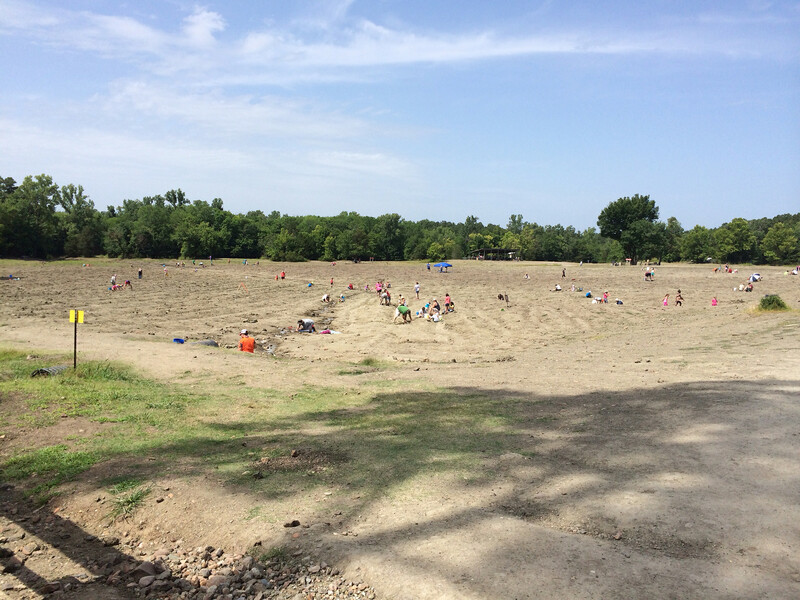 Did you know that the Crater of Diamonds State Park is the only place in the world where the public can dig for diamonds? 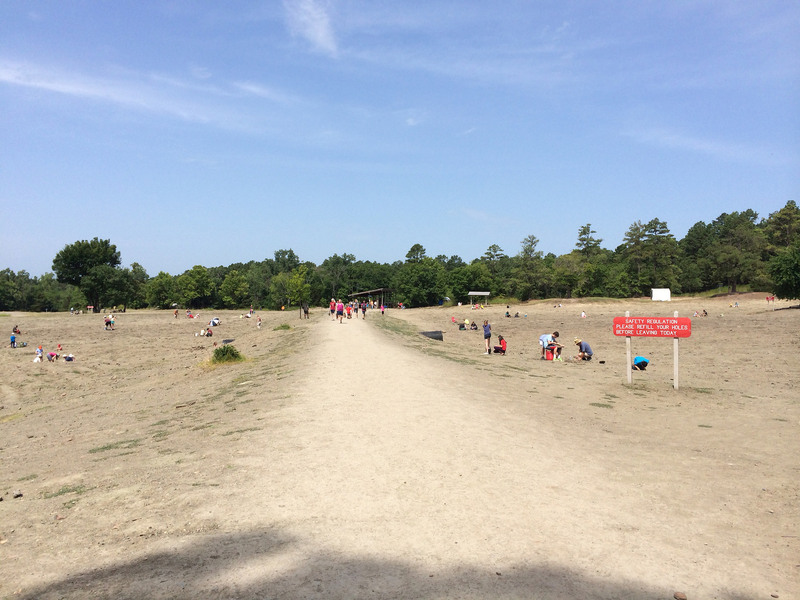 The Crater of Diamonds is a 911-acre Arkansas state park that features a 37.5-acre plowed field. Here people can come year-round to test their diamond hunting skills. For a small fee you can dig and hunt all day in search of that hidden treasure. A lot of people wonder if you get to keep what you find. The parks policy is pretty simple, if you find it you can keep it. It doesn’t matter how big or how small a diamond you find, it’s yours. We visited the park for the first time this past July and I’m not going to lie, it was hot! But that didn’t stop us. 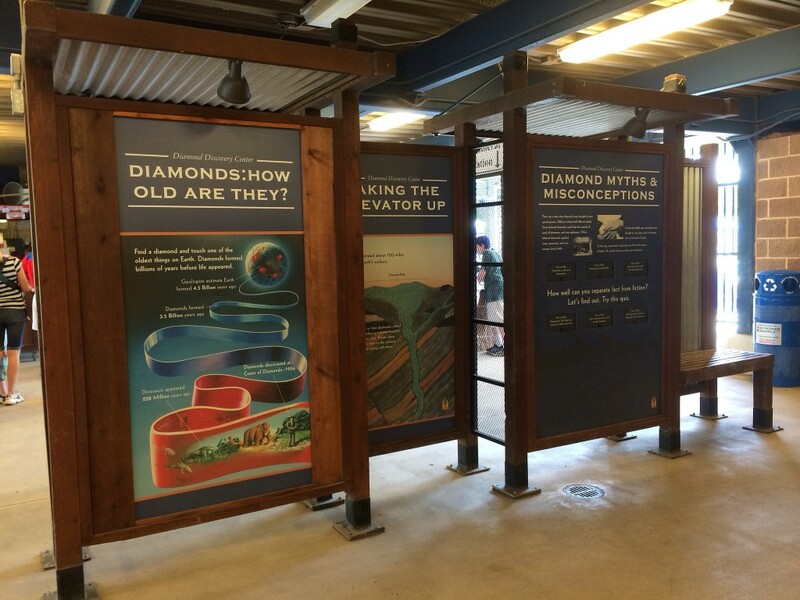 Because when you know how many diamonds have been found at the park, diamond fever takes over and it’s hard to walk away. You don’t have to bring any equipment with you to the field. Crater of Diamonds State Park offers rentals on everything from shovels, buckets, and sifting buckets. They are pretty reasonably priced. But be aware that you do have to put down a pretty hefty deposit on each piece of equipment you rent. Before you get to the digging area I recommend you watch the beginners video that’s offered. This video shows you how to dig, what to look for and how to sift through the dirt. If you’ve never dug for diamonds before, I recommend taking a little extra time to watch the video. It’s very helpful. In the lobby where you rent the equipment you will find a lot of information on the history of the park. For instance, it will show you the types of rocks and gemstones that you will find throughout the park. 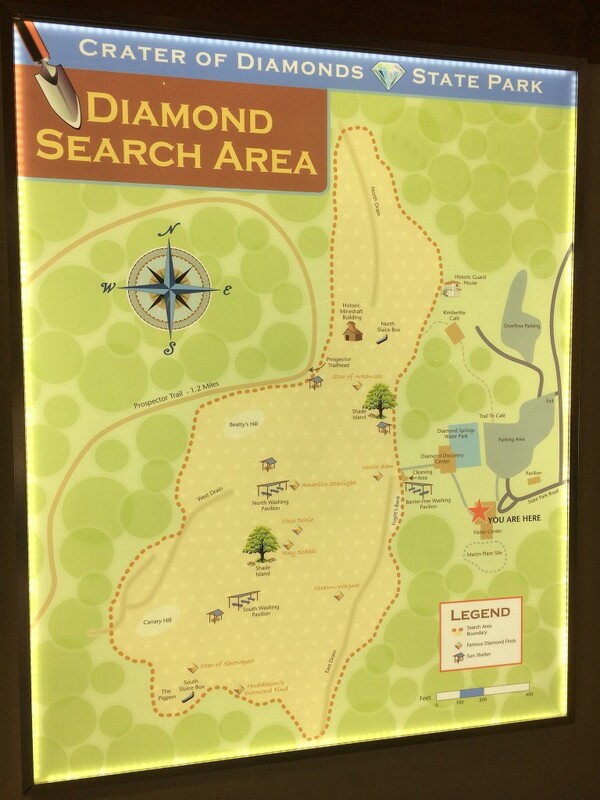 There are also maps of the search area that include the spots where the biggest diamonds have been found. We were so eager to get digging and it didn’t take long for us to get the hang of it. We dug holes, searched the surface and even sifted through rocks. There were many times we found rocks that we thought might be diamonds. When that happened we would head back up to the front building to have them inspected by the staff. Although we didn’t find a diamond during our two day hunt we did make some priceless family memories. There is nothing better than getting down in the dirt and hunting through rocks and sand with your family. Will we ever go back? Absolutely! I would love to go back and hunt when it’s not so hot because their isn’t a a lot of shade at the park and the heat can zap your energy pretty quickly. A couple of tips that I would suggest is to bring a hat, sunscreen and an ice chest with water. These three items, especially in the summer months, will help make the experience so much more enjoyable. Also there is a nice little restaurant only a small walk from the field where you can grab a bite to eat. The best time to search for diamonds is right after it rains or the fields have been plowed. On average their are 2 diamonds per day found at the park. The largest diamond ever found at the park by a visitor was a 16.37 carat diamond. There are three colors of diamonds found at the park these are yellow, brown and white. There are 40 different types of rocks and minerals found at the park. These include peridot, amethyst and garnet. 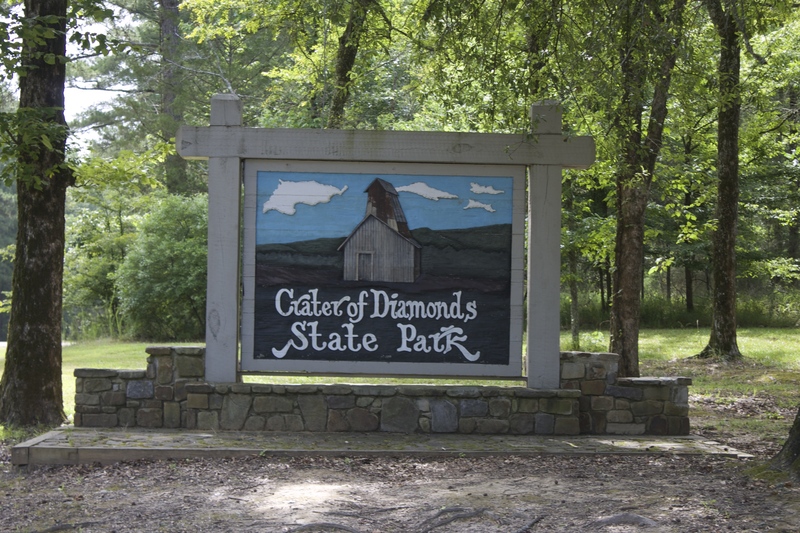 The first diamond ever found at the park was in 1906 by John Huddleston, the farmer who owned the property at that time. Have you ever been to the Crater of Diamonds State Park? Sounds like an interesting place to visit! It does look like it would be miserable on a real hot day but fun otherwise.